Located at the Youth Leadership Training Center in San Leandro, The Rock is a 32-foot natural looking rock with numerous routes to climb. Climbing routes vary in difficulty so everyone can have fun no matter what their experience level is. All boys and girls ages 6 and up are welcome to participate. Units may make a reservation to come and climb for a 2 hour session. 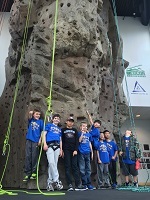 Units should come prepared with adults who are willing to learn and able to belay climbers. Instruction on belaying will be provided at the start of your climb. Cub Scout units must provide adult belayers as Cub Scouts cannot belay each other. Boy Scouts and Venturing Scouts may learn to belay. Cost: $15 per person with a minimum of 10 climbers. *$50 non-refundable deposit must be submitted to reserve your session. Please mail a check to our office (address above, c/o Michelle Behrendt) or call 510-577-9214 to make a credit card payment. Other dates - Subject to staff availability. Please email Michelle with proposed dates. Those Troops interested in doing a Climbing Merit Badge session for 8-12 Scouts may contact us to set up a session. The Climbing Merit Badge requires at least 6 hours of time to complete requirements, about 3 of which are classroom safety learning and knots and about 3 (or more) hours on practical skills in the Rock climbing area. 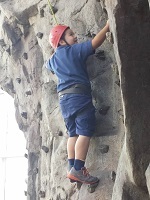 The Climbing Merit badge is also offered as part of Exploration Camp during all school holiday breaks. Email michelle.behrendt@scouting.org to set up your Climbing Merit badge session for your Troop. Available for use during the Boy Scout Summer Camp season, the COPE course is a great opportunity for Boy Scouts to participate in High Adventure activities with numourus high and low COPE challenges as well as a zip line. 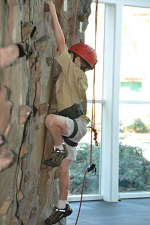 A natural, outdoor climbing site, the Climbing program area is open during the Boy Scout Summer camp season. Any Unit planning to have a climbing outing, must have at least one certified Level 2 Climbing Instructor. 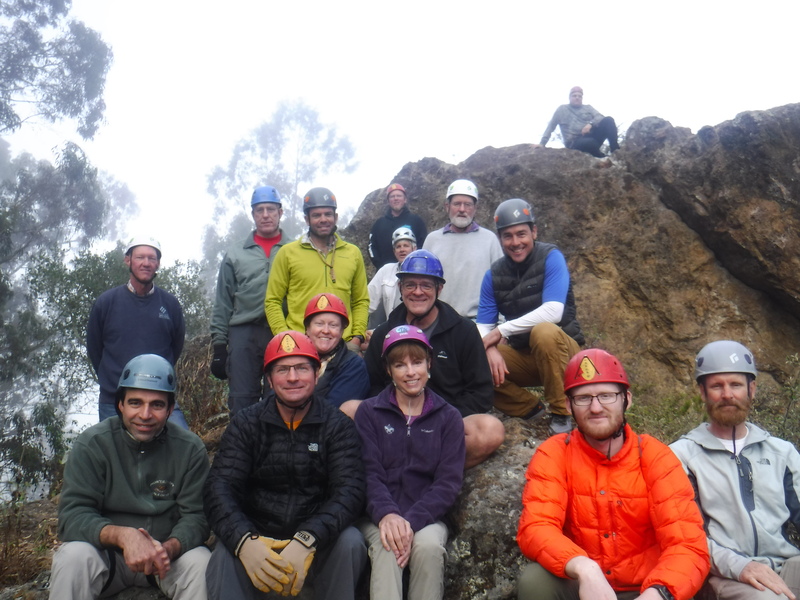 The San Francisco Bay Area Council is part of a Multi-Council Collaboration for Climbing Instructor Training. Individuals will be able to choose the appropriate climbing training session to match their climbing training needs. Grade A – An indoor facility, any climbing site that uses engineered protection systems. Grade B – Any climbing site that uses natural anchors (i.e. boulders or trees) or climbing bolts installed by a qualified individual. - Requires 30 hours of training. Grade C – A climbing site that uses artificial protection. - Requires 60 hours of training. Those individuals who are trained in a lower Grade that would like to become trained in the next higher level may attend a Transition training session of the following lengths. Content would include training in all those subtopics that have additional training time between the Grades. For questions regarding the Climbing Instructor Training, please email michelle.behrendt@scouting.org who is the current Climbing Program Manager for the Collaboration. Cost: $150 before 4/30; $200 after - Includes all meals(dinner Mon-breakfast Thurs), training material and lodging (camp tents). Note: Participation in all 30 hours (4 days) is required for completion of the course. Does your Troop, Crew or Team want to go climbing at an outdoor site? The San Francisco Bay Area Council has Climbing equipment available for rental to Boy Scout, Venturing Scout and Varsity Scout units. 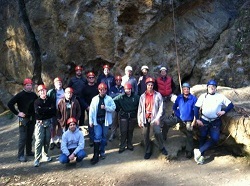 Equipment rental includes climbing ropes, ATC belay device, carabiners, harnesses, helmets and more. A Valid Credit/Debit Card must be on file during Rental in case of equipment loss or damage. Equipment MUST be checked out and in by a certified BSA Climbing Instructor Level 1 or 2. If units do not have access to an adult with BSA Climbing Instructor Certification, it is possible member/s of the volunteer SFBAC Climbing Committee may be willing to go with your unit to support a climbing trip. Contact Michelle at (510) 577-9214 or michelle.behrendt@scouting.org with your request to reach out to Climbing Instructors about planning a trip. Interested in SFBAC Climbing? Volunteers are always needed and welcome for all our Climbing programs. Those interested in helping with any of the above programs and/or becoming a Climbing Committee member should contact Michelle at (510) 577-9214 or michelle.behrendt@scouting.org to be added to the mailing list.